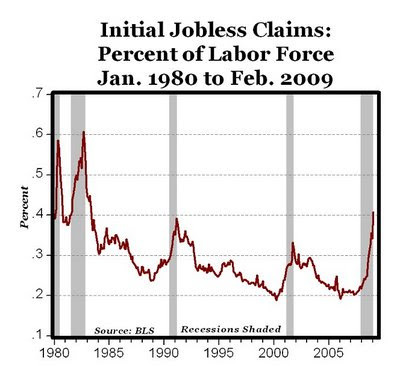 The chart above shows the “initial jobless claims as a percent of the labor force” back to January 1980. To reach the same level as the peak in 1982 of 0.6067%, today’s jobless claims would have to be almost 936,000, or almost 50% higher than the current 628,000. So how about we first get hysterical for awhile about the “worst economy since 1982” before we go totally hyperbolic about the “worst economy since the Great Depression.” Once we reach the 936,000 jobless claims it would take to equal the economic conditions of 1982, then let’s start talking about Great Depression II, but not before.